The final parameter is then the result of an Alteryx workflow built to combine the sets of data and to obtain a consistent indicator. Each team's value comes from the average of players' parameters. To improve the quality of our model we updated each player's score after every game to adapt the team's rating throughout the competition based on performance. Our unbiased view of the teams wasn't swayed by opinions. 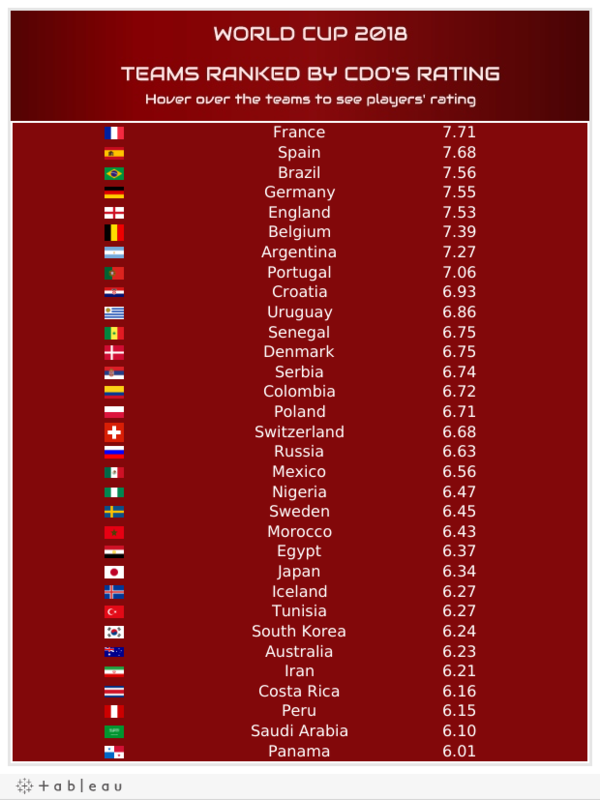 Even though we wanted to give England the highest rating, the data said from the beginning it wasn't coming home... but going to Paris instead. We are not geniuses, perfect predictors or match gamblers and we had a bit of luck to predict France as a winner. We did get things wrong, as it may be nearly impossible to predict every game, especially with the shock exits of some of the world giants. Not even data could foresee what happened to Germany. The difficulty in predicting football scores or results comes from the high number of variables that affect the outcome of every match. From each player's form to his mental strength to the "team chemistry". Our aim for the future is to improve the robustness of the model by including more variables and testing them through the course of the time. As the new Premier League season approaches, we are partnering with The Argus on a weekly predictor for the league so keep an eye out for posts from us to see if we can repeat our success! Topics: Insider, Making Data Work, Tableau, StorytellingWithData, Visualisations, 2018, "alteryx"